The latest generation, model 8043-11225 single-ram baler, features a large feed opening (80 x 43 inches, up to 80 x 70 inches) and up to 30 tons per hour capacity processing OCC. Other key features include: export bale capability, laser ram positioning, a cylinder drive inserter system and Category-3 safety. "We have combined the quickness of our 10-inch compaction system with the force of a 12-inch cylinder - also combining a new 225 hp unit," explains Mike Schwinn, American Baler's sales manager. According to Schwinn, American Baler Company made their first horizontal baler for the paper industry in 1945. "Single-ram balers are most productive in paper because the ram is pretty much always in compaction mode," says Schwinn. For textiles, he adds, they provide a full package that minimizes damage to product while baling. "But for some grades of plastic containers and non-ferrous metals - the quality of the bales and weights produced by single-rams will lead users back to two-rams," says Schwinn. "Also safety is a big consideration," he adds. "Category-3 balers with trap key systems and better guarding are increasingly in demand to improve the safety of baler operators. The tension system design on single-ram balers is typically most critical," he continues. 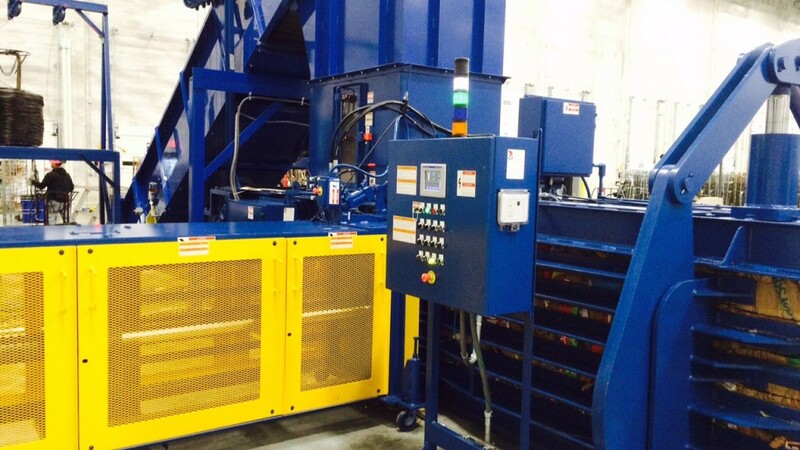 See American Baler as part of our focus on single-ram horizontal balers.